A Vintage inspired Black crush velvet Argentine Tango costume for competition and performance. Lace panels caress a beautifully tailored bust-line. The Soft velvet halter strap Creates a sweetheart neckline. The Lace back scoops down a little and has a Back zip. 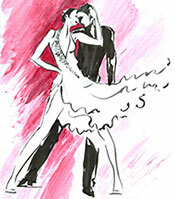 The essence of Tango is the Lace skirt edging. The hem is finished with fringe detailing curving up to a V at front for extra movement. The hem sweeps down at back with a center back slit. The crush velvet is very forgiving for the figure PLUS is an “easy wear’ fabric – so great for travel. This dress can be comfortably worn over a convertible halter/strapless bra. Rhinestones may be added to the lace. 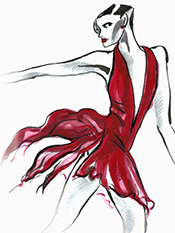 Linda Ayre garments can be customized for you with alternative details and fabrics. Please call for more info. SKU: 1656. 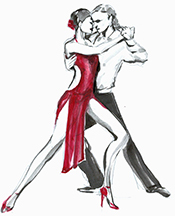 Category: Argentine Tango Competition Costumes. Tags: Argentine, Argentine Tango costume, Argentine Tango Dress, Back zip, black, Black crush velvet, Black Velvet, classic dance wear, comfortable dance wear, competition, costume, fringe, halter strap, hand finished, lace, Lace back, Lace skirt edging, latin, linda ayre, milonga, passionate outfit, performance, rhinestones, slits, Soft velvet, strapless bra, sweetheart neckline, tailored bust-line, tango, Vintage, Vintage inspired.